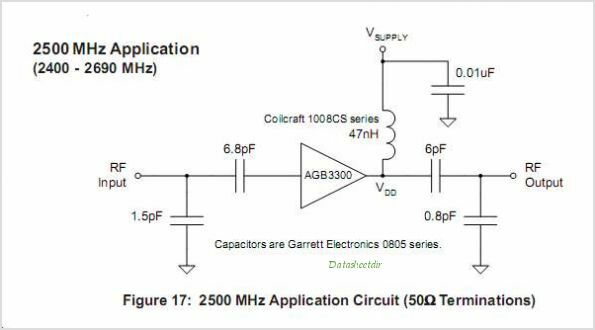 The AGB3300 is one of a series of GaAs MESFET Amplifiers designed for use in applications requiring high linearity, low noise and low distortion. With a high output IP3, low noise figure and wideband operation, the AGB3300 is ideal for 50 Wireless infrastructure applications such as Cellular Base Stations, MMDS, and WLL. Offered in a low cost SOT-89 surface mount package, the AGB3300 requires a single +5V supply, and typically consumes 700mW of power. This is one package pinout of AGB3300,If you need more pinouts please download AGB3300's pdf datasheet. 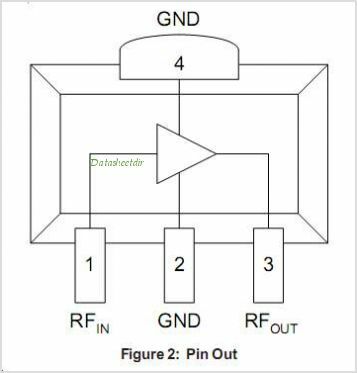 This is one application circuit of AGB3300,If you need more circuits,please download AGB3300's pdf datasheet.